The Northfield Blandin 8. What are they up to? Way back in November of 2010, two area teams of 24 people each (one team from Northfield; the other from Northfield/Dundas/Bridgewater) attended the Blandin Community Leadership Program (BCLP) in Grand Rapids. 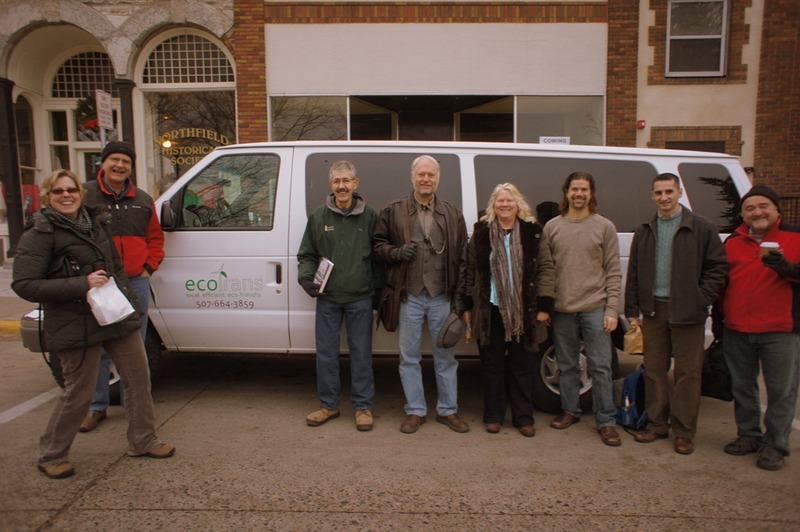 On early Wednesday morning, eight people from those groups departed Northfield in an Eco-Trans van for a few days of meetings at Breezy Point. Left to right in the photo: Erica Zweifel, Hans Muessig, George Kinney, Bruce Morlan, Paula Manor, Joe Gransee-Bowman, Matthew Rich, Norman Butler. What were they doing up there? How were these 8 selected from the 24? What’s been happening with the two groups in the past two years? As before, inquiring minds want to know.